When I had Arnold, he suffered from terrible allergies and I experimented loads with his diet to try and ease his itch. In the end it took a salmon/tuna and sweet potato diet (and the occasional stolen jar of cashew butter) to get him rash free and before you call me crazy- it was actually a little cheaper and significantly more effective than the medicine he was taking (and none of the long term side effects). I wanted something else I could give him that I could just grab at the last minute and these are just the answer. Winston, is obsessed with nut butter so he loves these too (but doesn’t quite have the willpower to sit beside them for an updated photo!). 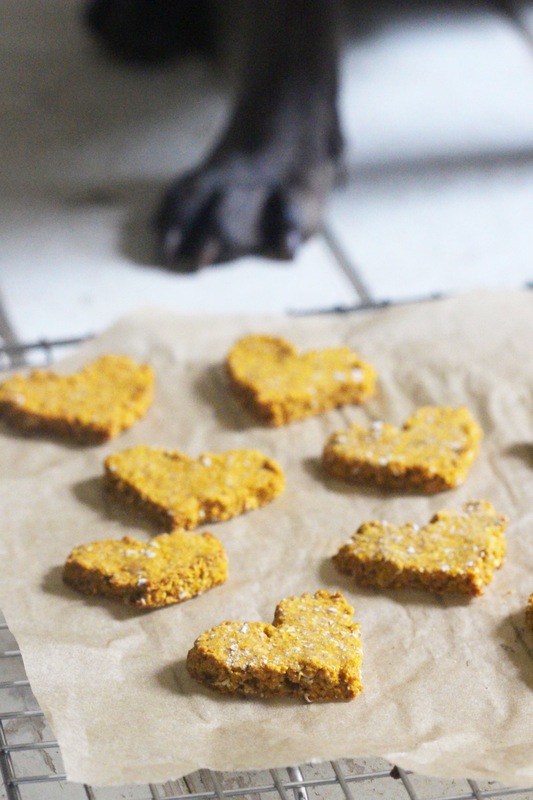 Whether your dog is on a weird diet or just in need of a yummy treat, they will absolutely love these. Just 3 ingredients to make 1 very happy dog. Preheat the oven to 200’C. Prick the sweet potato with a fork a few times and then bake at 200’C for about 45 minutes until tender. Then turn the oven down to 180’C for baking the biscuits. Cut the sweet potato in half and then set it aside until it’s cool enough to handle.While it’s cooling, add your oats to the food processor and blend until you have a flour. Scoop the flesh from the sweet potato (feed the skins to your dog!) and add it to a large bowl with the cashew butter. Mash them together until you have a paste. Add in three quarters of the oat flour and mix well until you have a dough, add in the rest of the oat flour gradually if the mixture is too sticky. If you don’t care about the shape just roll the dough into small balls and then press them into discs, otherwise roll out the dough and use cookie cutters. Lay the biscuits out on a baking sheet lined with parchment paper and bake at 180’C for about 20-25 minutes (depending on the size/shape) until crisp. Leave them to cool and then give them to your very grateful puppy. They should keep in an airtight container for about 2 weeks, Arnold’s never last longer than a week! For those humans with nut allergies making this, what’s an alternative to the cashew butter? Or just omit it & go with two ingredients? Thank you. Amazing! 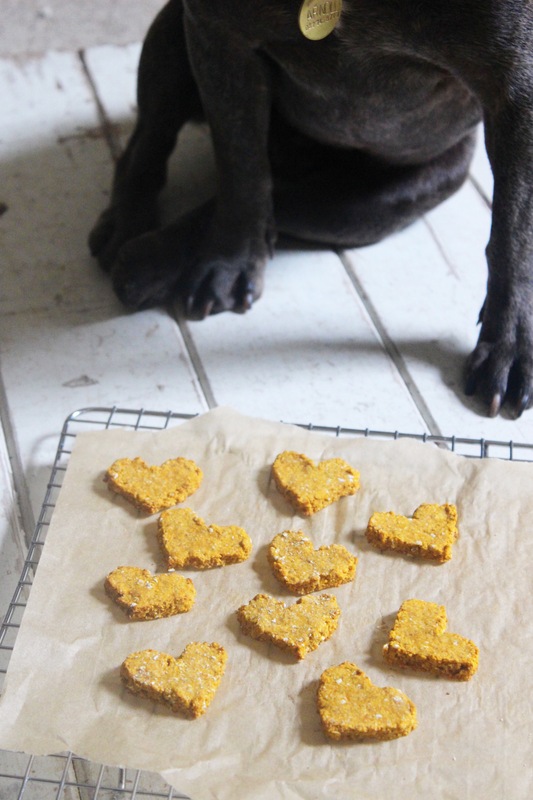 Can’t wait to make these for my frenchie! He loves sweet potatoes. 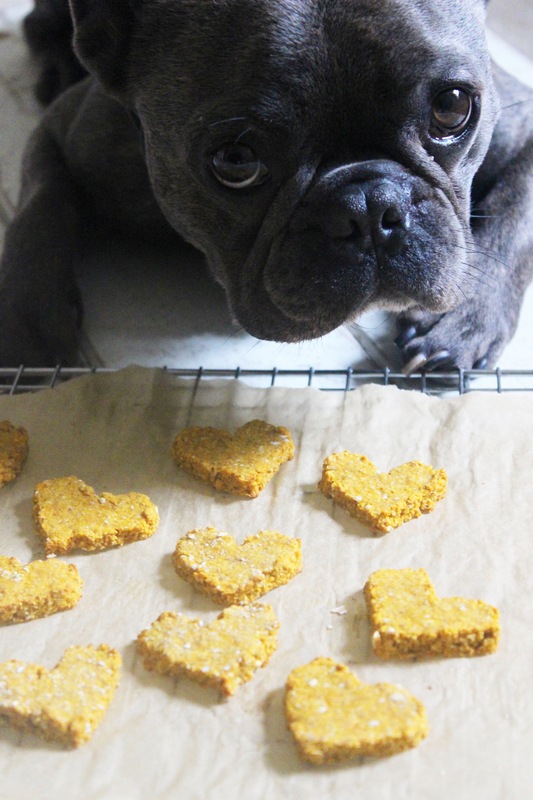 Cute biscuits, and oh my gosh – that face!! Gorgeous!